Sunday 23 April 2017 is La Diada de Sant Jordi (Saint George’s Day). The day celebrates the patron Saint of Catalunya combined with the Catalan version of Valentine’s Day. It’s customary for men to give women roses, and women to give men books. The ramblas in Barcelona and Tarragona will be packed with stalls selling both, plus there will be readings and book signings by famous authors. Even the smallest villages will have a few stalls on the streets. Today’s traditions have developed from a combination of historical events. In Barcelona, a rose fair has been held since the 15th century on the day of Sant Jordi. The day is also a celebration of books – a custom which began in Catalunya in the 1920s. Furthermore, since 1995, World Book Day has also been held on 23 April. (Incidentally, Shakespeare died on 23 April 1616). At L’Ametlla’s Sant Jordi beach, there is a day of events, including barbecued sardines, a paella competition, human towers and more. See here for details. In Montblanc, the town where Sant Jordi is said to have slayed the dragon, there is more than a week of Medieval-themed events. See here for details. 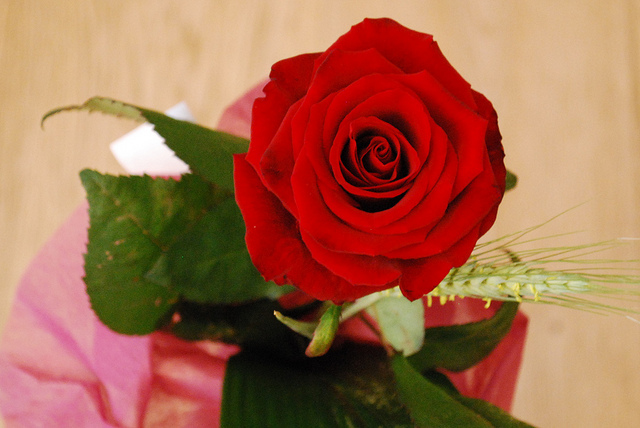 Header photo: A Sant Jordi rose, by mari_aquino on Flickr, reproduced under a Creative Commons licence.